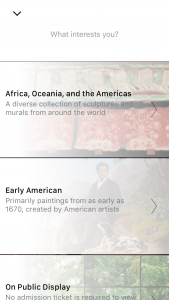 In October 2015, the de Young museum launched a new app to serve as a personal tour guide for museum visitors. 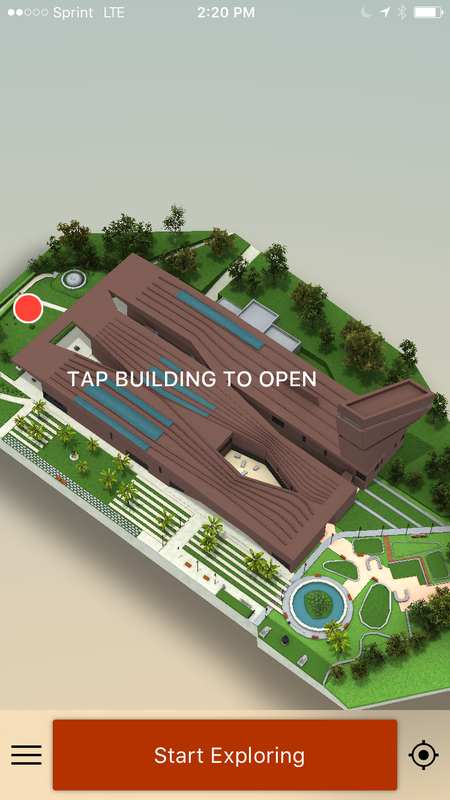 The app features an interior map of the building that pinpoints the user’s location and highlights selected artworks and museum amenities. Users are able to peel away the different floors of each building to fully interact and explore each level, revealing curated artwork tours and highly detailed information inside. 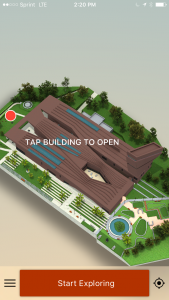 The app not only provides a detailed three-dimensional visual representation of the museum, but also utilizes the very latest in indoor navigation technology. The geo-accurate mapping employed allows visitors to better plan and navigate their museum visit. The development of the app presents an important technical case study for museums for the following reasons: first, its utilization of new technologies and direct partnership with tech companies; second, the development of engaging 3D visualizations of architectural space, coupled with a unique approach to content development; and, third, it’s use of accurate indoor navigation in order to obtain insight into visitor behavior. This paper will outline the development and goals of the de Young app, its key technical innovations, and user-based analytics in an effort to provide transparency about the museum’s goals and process, as well as useful benchmarking data for the field at large. From its onset, the conceptualization, technical development, and content production of the app was focused on the user. This emphasis on user needs and feedback encouraged key technological developments and provided a basis for quantitative and qualitative analysis post-launch. From a technological standpoint, this focus on the user is not new. However, its importance cannot be stressed enough, particularly for museums, which are often limited by internal assumptions about user intentions and actions. After comparing demographics data and other user-based statistics gleaned from the de Young app, it became clear that Web trends were not an indicator for how visitors navigate the museum space on site and what points of interest they find most engaging. Making sure to cater content for various channels based on such focused data is key for museum success in developing content and technology that is engaging and useful. Before launching into the technical details of the app, it is important to highlight the motivation behind this project and provide details about the museum and its mission. The de Young museum was founded in 1895 in San Francisco’s Golden Gate Park and showcases collections of American art from the seventeenth through twentieth centuries, textile arts, and art of Africa, Oceania, and the Americas. It reopened in 2005 in a state-of-the-art facility designed by Swiss architecture firm Herzog & de Meuron. The 293,000-square-foot building was designed as a heterotypical site aimed to present the museum’s expansive, encyclopedic collection in an interrelated and varied manner. As the architects explained in their proposal for the building, their goal was to “make the architecture of the new building permeable, open, and inviting for the people of San Francisco” (Mack, 2008). With its diverse collection and non-grid-like interior construction, the de Young building and collection can sometimes present challenges to museumgoers of various ages and comfort levels. While the openness of the building and its holdings encourages discovery in unexpected ways, it can be intimidating for visitors who seek a bit more structure and guidance. It should also be noted that the architects also wanted limited signage and physical wayfinding prompts within the building’s interior, an element that adds to this sense of discovery, but also often confusion. The printed maps and guides for the museum did not actively provide the context and information that visitors sought. Therefore, in order to foster a comfortable visitor experience and encourage engagement with works across this range of time periods and cultures, developing a roadmap, or guide, for users proved to be a real need for the museum. The solution needed to be flexible, familiar, and easily accessible for visitors. And so, the de Young looked to mobile. The museum had previously launched the app FAMSF:Voices the year prior, with a focus on curating and collecting a mix of curator and visitor stories about key works in the museum’s collection. The development of the former app provided a solid foundation for assessing the user needs at the museum; however, a more robust, comprehensive institutional app was still needed to better ground the visitor experience and provide a flexible means of learning and discovery. On a broader level, while museums have become increasingly proactive in offering new technologies to museum visitors over the past several years, the de Young saw the need to focus specifically on grounding the user experience more locationally, a feature that wasn’t yet present in many leading museum apps. Therefore, the de Young saw the benefit in seeking technical collaboration outside of the museum community. The museum’s three-pronged internal focus on technology, engagement, and content provided the perfect backdrop for partnering with a local startup to develop an app that would establish a more grounding guide for users, both on site and outside of the museum. As the museum was looking to develop a new app, Bay Area-based startup Guidekick caught the attention of Chief Information Officer Gary Castro. The company connected with Castro in the fall of 2014 while developing an app featuring chief historical points of interest in San Francisco’s Golden Gate Park. Impressed with the company’s design, vision, and technical acumen, Castro tasked the local company to develop an app specifically for the de Young museum. With its interest in changing the experiences and expectations people have at cultural attractions around the world, Guidekick jumped on board. From the onset of the project, the museum’s goal was to create a user-centric platform to aid in wayfinding and discovery, as well as to present content in a unique and engaging manner that would appeal to a millennial audience (eighteen- to twenty-four-year-olds, primarily). This emphasis on the user was echoed in Guidekick’s mission. Mark Paddon, CEO of Guidekick, explains, “As technology continually advances, we believe it’s important to take a step back and ask ourselves, ‘is this making the visitor’s life easier or more enjoyable in some way?’ Our motivation is to stay true to that question while simultaneously pushing the limits of technology and design at the rate it advances, creating experiences that are entirely unrivaled” (Paddon, 2015). In addition, it was essential that the app offer a strong foundation to build upon technically, with the understanding that mobile is a fast-growing and constantly adapting channel, and that user data would necessarily inform the design and functionality of the app itself in future iterations. Data tracking would also become an important element in the build of the app, allowing the museum to visualize previously unknown visitor paths and engagement statistics, which would in turn aid in the strategy development for the marketing, communications, curatorial, and digital departments. Capturing this data would allow the museum to not only better understand its existing audience, but also expand it. The de Young museum saw a total visitation of over 1.1 million visitors in fiscal year 2014–2015, with the median visitor being forty-five to fifty-five years old, educated, and female. How could the museum expand to attract and facilitate enticing experiences for a younger audience, potential future patrons to the museum? Current Web analytics data, coupled with research from the marketing firm Alexander Babbage in the fall of 2014, confirms that the de Young museum audience is Web proficient and locally based (McKeon et al., 2014). 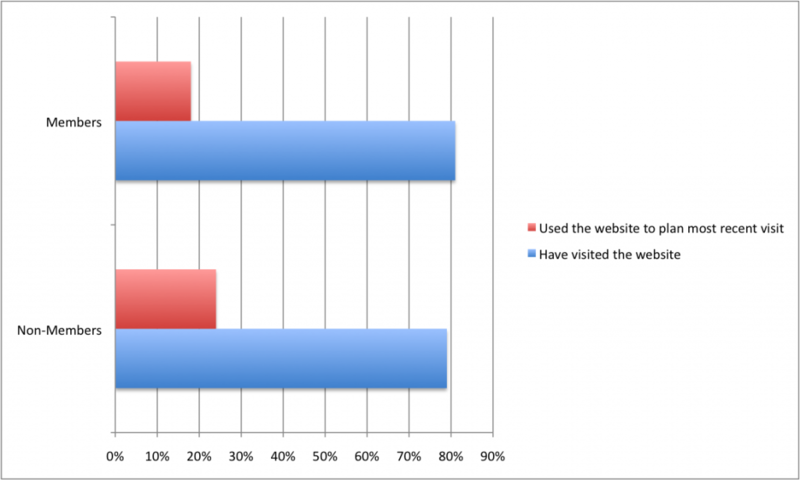 The survey revealed that well over 75 percent of visitors surveyed reported having visited the museum’s website (Figure 1), a detail confirmed via Web analytics data. In fiscal year 2014–2015, the famsf.org website saw 3,883,534 sessions and 13,417,563 page views, with an average of 3.45 pages viewed per session. 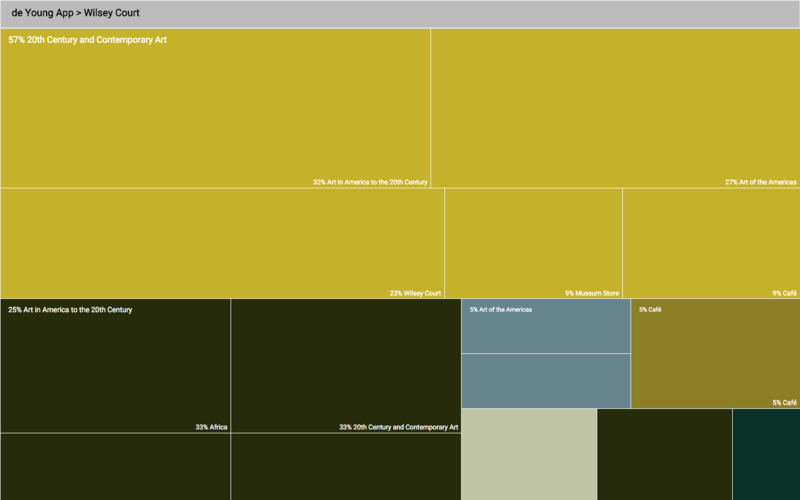 The deyoung.famsf.org subdomain specifically accounted for 1,985,440 sessions and 5,269,759 page views. It is important to note that mobile is a fast-growing channel for de Young museum Web users. In fiscal year 2014–2015, over 31 percent of the Web audience to the de Young museum subdomain came from mobile and 13 percent from tablet (Figure 2). This represents a 40 percent growth on mobile and 14 percent growth on tablet from the previous year. 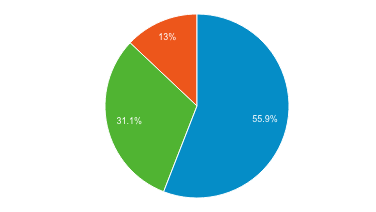 Out of mobile users, 54 percent used Apple iPhone and 27 percent used Apple iPad. Various Android devices accounted for less than 1 percent of traffic each. It is also clear from Web visitation stats that Apple products have led the way in terms of device popularity, and that mobile is a comfortable and expected channel for the museum’s visitors (Figure 3). CNET confirms this trend of smartphone usage largely surpassing feature phone usage on a national scale in a 2013 study. At the time of the study, 91 percent of people in the United States owned a cell phone and 56 percent of adults were smartphone users; the numbers have since risen (Kerr, 2013). Similarly, the 2014 study “A Closer Look at Arts Engagement in California” reported that 40 percent of all Californian adults consume arts through a handheld or mobile device (Novak-Leonard, Wong, & English, 2014). 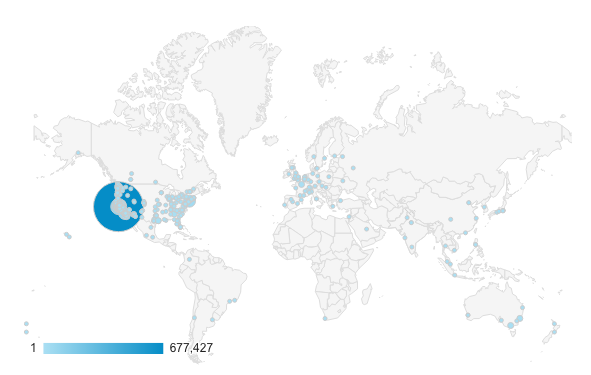 In addition to being proficient and mobile-focused, the de Young’s Web audience also skews heavily local. Of Web users on deyoung.famsf.org, 91 percent are located within the United States, of which 82 percent are located in California, the vast majority situated in the San Francisco-Oakland-San Jose Nielsen DMA region (Figure 4). From this data, it can be inferred that Web and mobile channels should be more catered to a local audience. Thus, marketing survey data and Web analytics paint a current profile of the museum visitor as Web proficient, increasingly mobile-focused, and local, with a preference for Apple products. However, at the onset of the project, the museum was not catering its technological offerings to this particular audience. More importantly, the museum did not have demographic data or research available around mobile app usage in particular. The de Young was still relying on paper maps and audio guides as the chief channels of information sharing and wayfinding for visitors, vehicles which could not be tracked, minus overall usage statistics. Less than 1 percent of visitors opted for either an audio or docent tour of the museum’s temporary exhibitions or permanent collections in Fiscal Year 2014–2015 (Girardeau et al., 2015). Looking at the data and current state of visitor experience offerings, it became clear that it was imperative that the museum expand upon this increasing comfort with Web and mobile, and to note the popularity of Apple products, as well as the locality of its user base, when developing its next app. 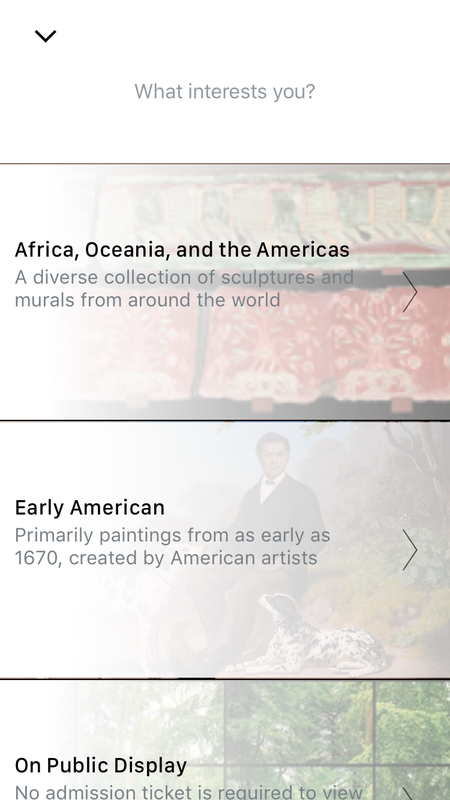 With a shared understanding of the museum’s goal in developing an app and the data available about current museum visitors in mind, the de Young staff worked with Guidekick to begin the development process, which lasted roughly six months. Key app features and development strategies are outlined below. Having worked on developing apps for Golden Gate Park and Hearst Castle, Guidekick had previously built out wayfinding features via GPS, as all locations featured were outdoors. While the groundwork for focusing on location-based experiences was laid with those apps, the de Young presented a unique challenge in its need for indoor wayfinding and its copper exterior, which posed challenges regarding Wi-Fi connectivity and hardware installation. The team needed to find an out-of-the-box solution to improve connectivity and indoor wayfinding. This emphasis on location and wayfinding is a fairly new focus for museum apps, most of which focus wayfinding prompts via Beacon triggers; in short, there was no existing solution to meet the museum’s current needs. Therefore, the team sought out to investigate the leading tech companies involved in indoor positioning. Tracking the coordinates and precise user location indoors is a difficult problem to solve, involving sophisticated mathematics and limitations in existing phone technology. At the time Guidekick and the de Young began developing the app, the technology for indoor wayfinding was not fully finalized, though many companies were gaining ground. In developing this new technology, the app team followed R.L. Martin’s flexible design strategy outlined in the Harvard Business Press. As Martin states, “Design thinking has been called a process for ‘problem-solving.’ However, a more accurate description of design thinking is ‘problem-framing.’ The define phase, which follows empathy, involves synthesizing findings in order to identify and articulate an approach to the challenge” (Mitroff Silvers et al., 2013). Using its experience in previous app development and focusing on the needs of the museum, Guidekick continued to develop the user experience and mapping components of the app, while flushing out the details of the indoor technology component. 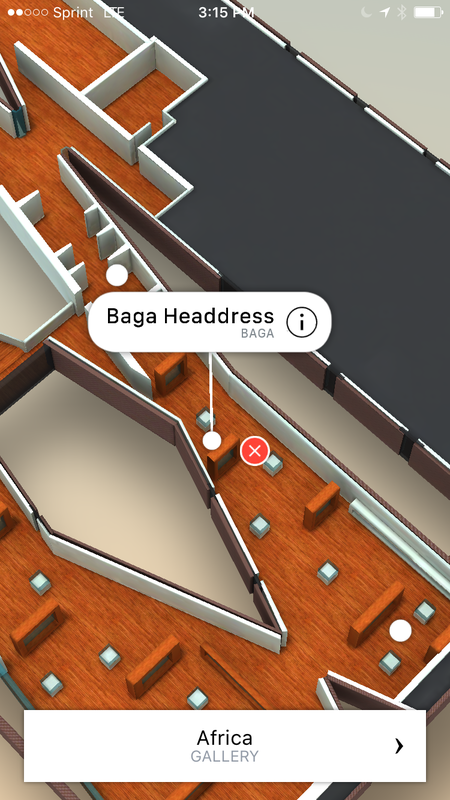 After much investigation and experimentation, the latest technological advancements in indoor mapping developed by tech giant Apple Inc. provided the ideal foundation to incorporate wayfinding into the app. The de Young app is in fact the first museum app to design an experience around the newest indoor navigation technology by Apple, via use of WiFiSLAM (Simultaneous Localization And Mapping). With this technology, typically associated with autonomous robots, Wi-Fi routers’ ambient signals are mapped and used to determine user—and in this case, visitor—location. 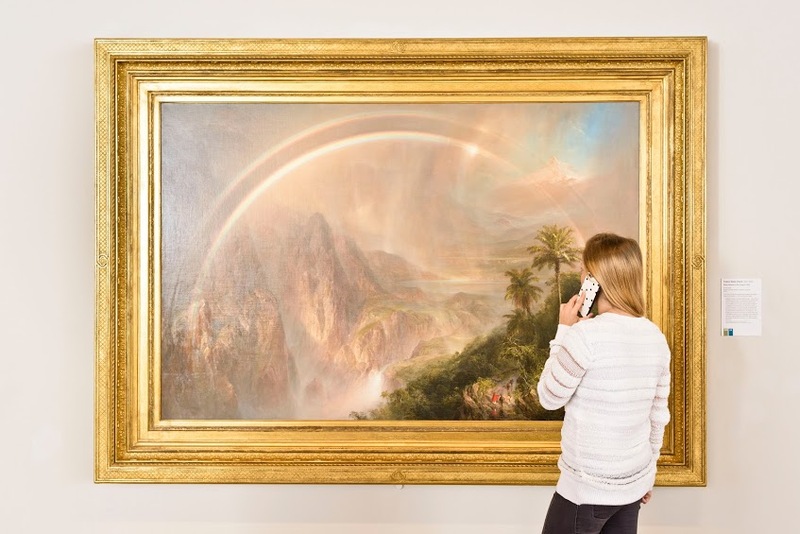 WiFiSLAM successfully eliminated the need for new hardware infrastructure, a particularly attractive solution for museums, which typically boast intricate state-of-the-art architecture and complicated gallery installations. By eliminating the need to pull expensive cabling and install hardware in the museum space, this new technology posed less of a strain on museum resources. Because the app would feature such advanced indoor location finding technology, it was important that the visualization of the indoor spaces be visually simple, accurate, and engaging as a way to activate and direct the user experience within the space of the museum. The resulting 3D visualization of the de Young building is both visually engaging and technologically innovative for museums. 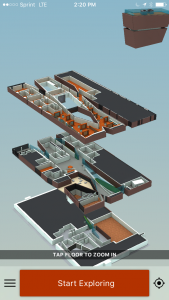 The experience in the app is grounded in a beautifully rendered model of the building, which separates into multiple floors once touched, allowing users to zoom in and out in a manner that is easy to operate, simple, and informative (Figures 5–7). 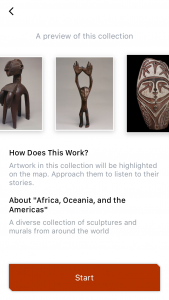 As users interact with the app to understand their placement in the museum and the offerings at large, they can more easily navigate its spaces and locate key works in the museum’s collection. While designing the 3D rendering for the building, the Guidekick team utilized its background in video game technology and design, again expanding its technical insight beyond current museum offerings. The design process began with a physical prototyping process that mirrors the traditional process of exhibition design using museum models and scaled artwork markers. Using blocks of foam structures, the team brainstormed how people would most easily navigate the space in 3D form, without cumbering the design with too many buttons and prompts. Moving further into the design and development phase, the team used a combination of software and tools to map the space, referencing CAD drawings of the building and GIS data of the terrain. The team had to ensure the map was geo-accurate so that the indoor positioning would show accurately on the app. This was in addition to the challenge of creating an interface that conveyed enough guidance for users, while being careful not to clutter the design with too much information. As Laura Mann explains, “More is not necessarily better when it comes to [mobile]” (Mann & Tung, 2015). Once the technical framework for the 3D mapping was achieved, the team worked with an artist to streamline the design. As the team developed the mapping feature, it initiated several rounds of user testing, averaging five to ten users per round, and iterated upon its design based on the feedback received. Once the visual mapping of the building was complete, the developers plotted location markers for the thirty-three selected artworks or points of interest featured on the app. As app users navigate the space of the museum, the app triggers notifications about key artworks using iBeacons. Because the WiFiSLAM technology can have drift or error while calibrating, the iBeacons ensure accuracy for targeting these key moments in the user’s app journey. These key artworks were selected by museum curators as the most engaging, representative, and art historically significant works in the museum’s collection. 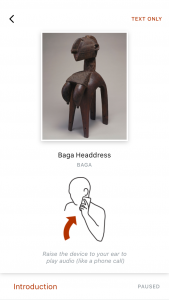 The works are curated according to several “tour” types—for example, a tour featuring art of Africa, Oceania, and the Americas (Figures 8–11)—but they are also available for investigation on a more individual level. Marrying engaging content with the current design framework was key in creating an app that would be informative, engaging, and relatable for visitors. The content on the app is therefore presented in a manner that is variable and flexible to the user’s desired journey. Users, for instance, can select a thematic tour that more carefully leads them to a curated set of works, or they can decide to navigate the spaces freely, with alerts still available as they pass the selected artworks. Such dynamic and adaptable content design is particularly appealing to a more visually literate younger audience, a demographic that has come to expect technological experiences that are mutable, visually appealing, time sensitive, and personalized. In addition to presenting a flexible user experience, the content is presented on the app in interesting and new ways. From a content perspective, it was crucial to create an experience that was both educational and inspirational for visitors. The 2014 marketing survey for the de Young conducted by Alexander Babbage (McKeon et al., 2014), referenced above, highlighted the key motivations for museumgoers. The majority of those surveyed pinpointed seeing or learning something new as a top driver in visitation to the de Young. Another common driver of visitation was the desire to be made to contemplate. Finally, visitors sought to share communal experiences and be “awestruck.” Similarly, when visitors were asked to select the most fitting positioning themes to best illustrate their motivation for visiting the museum, the most resonant themes focused on “discovery” and “appreciation of art” (McKeon et al., 2014). Alexa Beaman, director of Experience at Guidekick, worked on the museum’s former app, FAMSF:Voices, and adapted some of the lessons learned in the app’s development to the de Young app. In developing audio content, Guidekick interviewed curators in front of the featured artworks, thus garnering raw, more personal stories than museumgoers are used to hearing in the typically academic and dry audio tours available in museums. 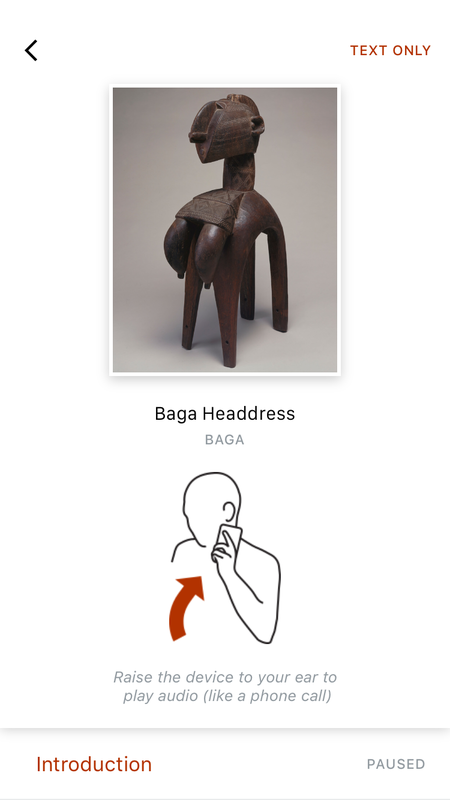 Instead, the conversational narration was inviting and fresh; using the app felt more like visiting the museum with a knowledgeable friend than a talking head. Museum surveys similarly confirm that users are most interested in content that is emotionally resonant, thought-provoking, and educational (Goldberg, 2013). The de Young app presents audio interviews from curators in this fashion, and offers supplementary text and images about the works selected. Again, user choice is paramount: users can engage with the material in whatever form they feel most comfortable. The content structure also allows users to engage with the material differently when on site, looking at works in the collection, or when off site, gearing up for their visit. For example, an audio tour might be more enticing within the space of the artwork, but text might be more appropriate if using the app during a bus ride. The audio featured on the app is not only conversational and compelling, but also presented in a manner that doesn’t interrupt observation of the artwork. Guidekick developed a new phone-to-ear feature to present the audio components of the app (Figure 12). When a user is in front of an artwork, content on the app is triggered and displayed on the screen. If the user would like to learn more about a particular work, he or she can simply hold the phone to his or her ear as if taking a call, triggering the accompanying audio interview. When or if the user moves the phone away from his or her ear, the audio pauses automatically. This allows for seamless investigation of the artwork. When looking at a work of art, there is no distraction from the discovery experience. Instead of looking down at a phone, reading a wall label, or fiddling with an audio guide, the user can move around the work and engage with it directly as he or she learns more from a trusted source. As Sandy Goldberg explains in a paper for the American Alliance of Museums, while “Content is King” has become the marketing mantra de rigueur over the past several years, considerations to adapt content to mobile are falling short. For mobile app content in particular, content effectiveness is dependent upon the user’s mobile experience with it; as Goldberg explains, “Mobile content is experience design” (Goldberg, 2013). Guidekick’s development of phone-to-ear audio supports this charge to create experiences for users, as opposed to simply offering information. Goldberg explains the benefit of this method of development, stating, “When designed well, mobile content can restore what’s lost when objects are presented in a museum in the first place” (Goldberg, 2013). The goal of the app is to activate existing objects, not to distract from them. In her 2013 paper for Museums and the Web, Alyson Webb echoes this need for flexible and user-based content design; she reminds us of the importance of mobility with mobile app development and asks, what does being mobile mean for our content and how can we best optimize for that experience? (Webb, 2013) The de Young app by Guidekick offers one solution in its focus on flexible user experiences and multiple ways to access content. As Natasha Waterson and Mike Saunders point out in their 2013 paper for the American Alliance of Museums, historically, visitor studies have not fully explained why visitors decide to come to an institution or what they specifically sought in their visit, as motivations and needs can change from visit to visit. Apps, by contrast, can provide a scalable model for repeat interaction by users (Waterson & Saunders, 2013). With this in mind, data collection and analytics were key motivations in the development of the recent de Young app. In fact, the app offers important insights to previously untracked user behaviors within the museum. Data tracking museum hotspots, in-gallery visitor flow, and engagement with specific works on view was unavailable prior to the launch of the de Young app. Similarly, while previous marketing reports based on the museum audience outlined some visitor motivation and demographics profiles, this data was not linked to technology in particular and was furthermore based on an overall smaller participant base. This section will outline key findings from the resulting data and point to possibilities for improving internal functions of the museum based on data trends and analysis. From October 29, 2015 through December 31, 2015, the app was downloaded by 10,700 users, with a total user base of 8,433 participants who engaged with the app through at least two separate sessions. The user journey paths outlined below focus on 614 super users. These users installed the app, accepted location permissions, and used the app on site at the de Young for thirty minutes or more. Demographics and other data reporting focuses on the overall app audience. The diagrams above show the path taken by a user who engaged with the app for a total of 4 hours and 51 minutes on an iPhone 6 while navigating the first and second floors of the de Young museum. The dark brown path indicates the user was on an “Early American” tour, while the brick red path indicates the user was on the “Africa, Oceania, and the Americas” tour. While the above diagrams show the path of a model superuser, the engagement garnered confirms previous museum marketing reports ranking education and discovery-based motivations as the highest drivers of museum visitation. That is, while the average museum visit at the de Young lasts roughly an hour, when engaging content is offered in an easy-to-use manner, longer and more engaged visits may result. In order to better understand visitor motivations and interests within the museum, it was important not just to record user paths on an individual basis, like above, but also to chart the most trafficked areas of the museum and the most popular artworks. Therefore, further content and heatmap tracking was needed. This collected user data would provide the most useful insight for making larger institutional decisions around marketing, digital presence, and content. At a higher level, the app analytics allowed for an aggregation of many visitor paths to analyze across all users. The team was able to use these aggregated paths to generate heatmaps of movement and interaction through each floor of the museum. The heatmaps below (Figures 15 and 16) allow the museum insight into which galleries are the most popular and, in the future, will help track how physical changes in the museum impact visitor movement. The app team is also currently working to segment demographic categories into heatmaps too. 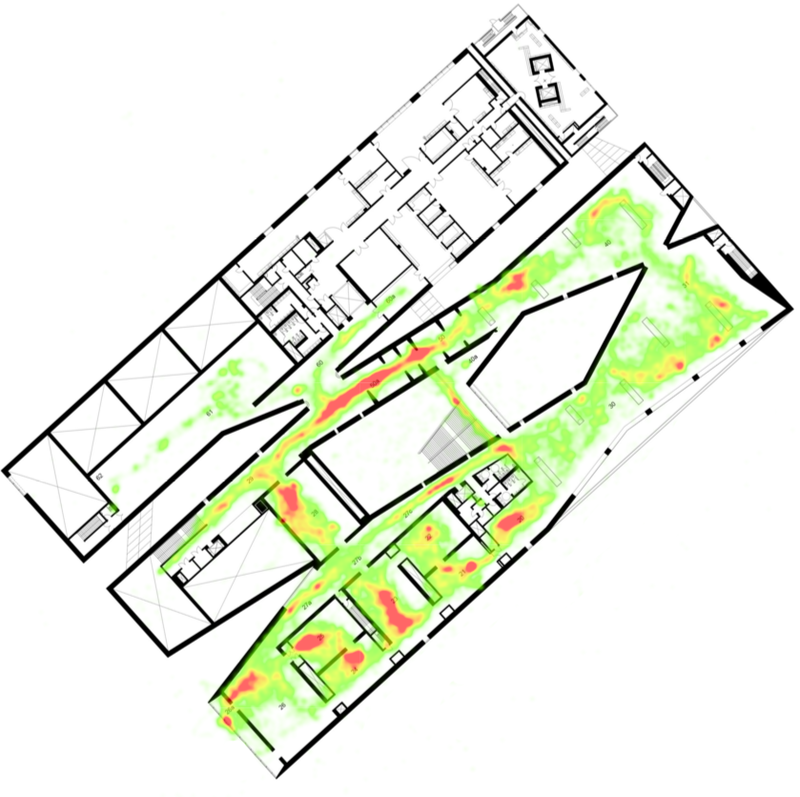 The above heatmaps of the first and second floors, respectively, indicate that the most highly congested, or popular, areas in the museum are the main atrium (Wilsey Court), with a particular hotspot around a featured artwork in that space, David Hockey’s Seven Yorkshire Landscapes, followed by galleries featuring modern and contemporary American and European art on the first floor, the staircase to the second level, and the American art galleries on the second level. Later in this paper, analytics based on specific user paths and the most listened to content sections will confirm these popular regions and museum highlights. Furthermore, the heatmaps showcase popular locations where the de Young app currently has no content or added value to the visitor—for example, the Café and the Glass and Ceramics gallery on the first floor. This information will prove invaluable in future updates and iterations to the app content and design. 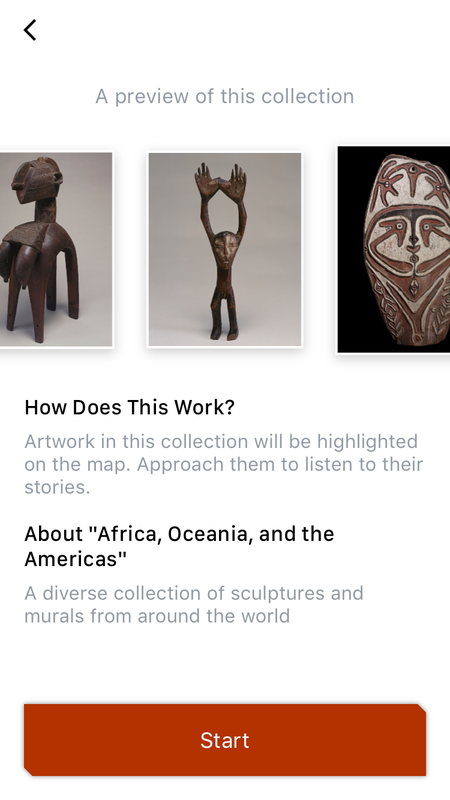 Before honing in on key artwork interests and engagement points in the app user journey, it is important to understand the directional flow of visitors within the museum space. While heatmaps are extremely useful in visualizing movement throughout the museum, they do not convey in what order or showcase the most common routes visitors take. In order to begin answering questions about the most popular paths in the de Young, data was visualized into a tree map format. The graph below (Figure 17) illustrates which part of the museum the visitor started in, which part of the museum he or she most likely visited next, and so on, exhaustively examining all possible routes taken through the museum. The maps above allow us to visually explore the most common routes taken by all on-site visitors. We can see in the first map (Figure 17) that the majority of app users start in Wilsey Court, the large central atrium that greets de Young visitors. From here, the next most likely course of action for visitors is to tour the Contemporary Art galleries, followed by a visit to Colonial American art, and then a visit to the Museum Café. The most popular user path, starting at Wilsey Court, is highlighted in Figure 18. The majority of users who begin their app experience in Wilsey Court then move to the Modern and Contemporary galleries, followed by Art of the Americas, then back to Wilsey Court to the Museum Store and Café. As the app is updated with new tours, content, and features, the team will be able to compare popular routes through the museum over time. In a similar manner, marketing and curatorial teams can seek ways to activate overlooked areas of the museum and further highlight the most popular sections. In addition to the path a visitor takes over time, the de Young app also tracks how content is accessed along the journey. The markers on the visitor path indicate where the visitor stopped and began listening to audio. The museum staff is then able to track what content was listened to and the percent completion for each. This allows the museum to gauge action taken by the visitor as he or she moves about and explores the museum. 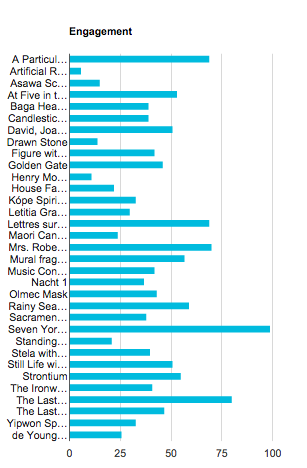 The graph above (Figure 19) shows the percentage of completion of the featured audio tour “stops” on the app. From this graph, we can see that the five most engaged with artworks or features were the following, in descending order of engagement: David Hockney’s Seven Yorkshire Landscapes, Larry Rivers’ The Last Civil War Veteran, Ed Ruscha’s A Particular Kind of Heaven, Mary Cassatt’s Mrs. Robert Cassatt, and Frank Stella’s Lettres sur les Aveugles II. From the same date range on Web (October 30–December 31, 2015), we can infer popularity of key artworks in the collection based on searches to those artworks on the Collections Web database, art.famsf.org; however, those numbers don’t necessarily translate into on-site visitation trends and motivations. If you compare to the total views of each artwork specified on art.famsf.org during the same period that the app data was collected, the artwork popularity ranks as follows: Ed Ruscha (571), Frank Stella (314), Mary Cassatt (116), David Hockney (58), and Larry Rivers (46). As this data makes evident, Web trends are not a predictor of how visitors will navigate the museum space and what they will find engaging on site. 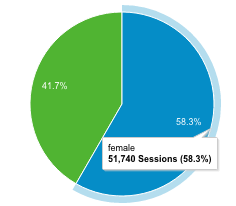 Another important aspect of the app analytics is demographic data, which further helps pinpoint user motivation. Currently, the app requires no personal information, but anonymous usage statistic are still able to provide insight into the audience using the app at the museum. One initial goal of the app was to engage the millennial generation, as stated above. Millennials are not only a currently underserved population for the museum in terms of technological offerings, but also represent a low percentage of the de Young’s overall visitor base. 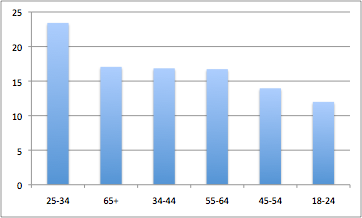 App demographics reporting based on age (Figure 20) show that app users skew younger than both on-site visitors, which average at fifty-five years old, and website users, of which the range from eighteen-to-twenty-four years old represents the least engaged age group online (Figures 21 and 22). 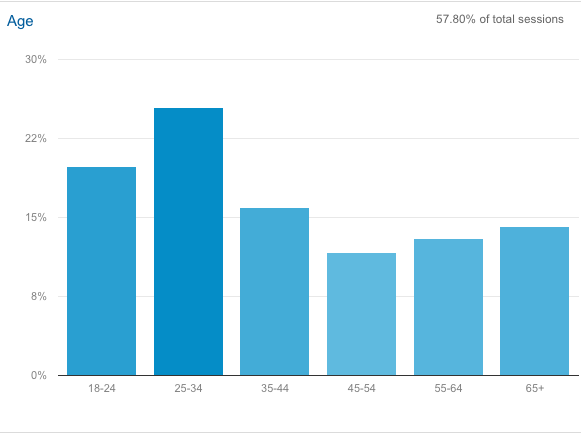 While the deyoung.famsf.org website also skews relatively young in its most popular user demographic base, its results were more varied in terms of popular age brackets. Users aged twenty-five to thirty-four make up 23 percent of all Web users; those sixty-five years and older, 17 percent; thirty-five to forty-four years old, 17 percent; fifty-five to sixty-four years old, 17 percent; forty-five to fifty-four years old, 14 percent; and, eighteen to twenty-four years old, 12 percent. As with the most popularly ranked artworks for on-site visitors using the app, Web statistics did not prove a direct indicator of app behavioral and audience trends. As mentioned above, it is clear that Web statistics cannot accurately predict user trends for app features, and this is also true in regard to the gender breakdown of app and Web users. 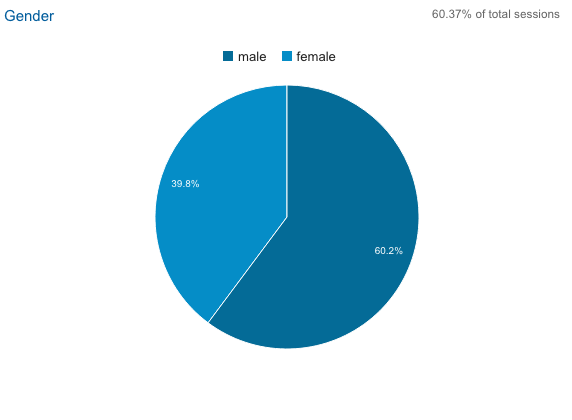 While the de Young website has a more predominant female user base, with 58 percent of all user sessions coming from females, the de Young app skews heavily male, with 60 percent of users being male. The stats are, in effect, flipped for the two channels (see Figures 23 through 25). 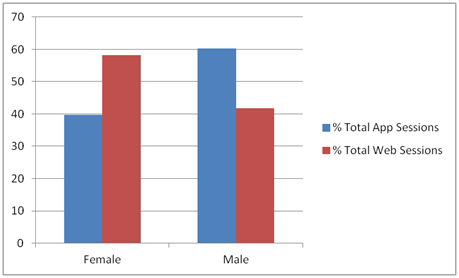 Similarly, marketing surveys, as noted above, charted the typical de Young museum visitor as a female in the age range from forty-five to fifty-five years old. The app, on the other hand, was most widely used by twenty-four- to thirty-five-year-old males (see Figure 20). Again, market research and Web statistics do not provide a firm basis for predicting app usage trends. This is an important industry note: instead of repeating content and design strategies across all channels and devices, museums need to have catered content and design for each. Understanding the key user base for various channels will help museums develop more robust marketing and content strategies and further engage and educate visitors. In conclusion, the newly available data from the de Young app about app user demographics, key hotspots in the museum, visitor flow, and the most engaged with artworks on site combine to paint a more complete picture of on-site visitor trends within the museum, data that was previously unavailable. The new data confirms that reporting from other channels and devices is not a predictor for app trends. By sharing these reports museum wide, various departments, from education to curatorial, marketing, and digital, various departmental stakeholders can better strategize and prepare more engaging and thoughtful content catered to on-site visitors. As a result, collection highlights promoted on electronic signage slides in the main museum entryways, printed maps featured artwork highlights throughout the building, educational programs and tours, marketing signs and print outs, among many other materials and channels, can better showcase material that is suitable for how visitors navigate the space. This type of cross departmental collaboration and data sharing is an important model for expanding the scope and strategy of museum functions. In summary, the recently launched de Young museum app serves as a model of technical innovation as well as an important case study in collecting device-specific data to help better inform how museums can customize content and market more strategically to on-site visitors, particularly of a younger generation. 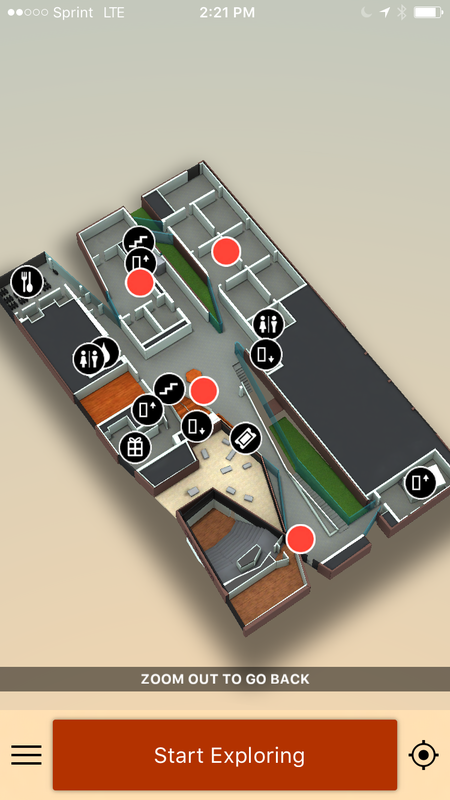 The design and development of the app provides key learnings in regard to its direct partnership with tech companies to conceive new technology—specifically, (1) its development of geo-accurate indoor positioning based on WiFiSLAM technology, (2) its design of 3D spatial renderings, and (3) its use of indoor positioning to obtain previously unrecorded insights into visitor behaviors and trends. Not only does the development of the de Young app provide technical insights for museum professionals, but the recorded analytics from app usage also confirm that audiences and motivations vary according to channel. In this sense, the data provides a useful snapshot into the on-site visitor experience, thus informing marketing, content, education, and curatorial strategies. As museums continue to expand their technical offerings, it is important that they strategize the design and content specifically for each device, and track and share data to test user behavior assumptions. Mack, Gerhard (ed.). (2008). Herzog & de Meuron: Herzog & de Meuron 1997–2001. The Complete Works. Volume 4. Basel/Boston/Berlin: Birkhäuser. Mann, Laura, & Grace Tung. (2015). “A new look at an old friend: Reevaluating the Met’s audio-guide service.” MW2015: Museums and the Web 2015. Published February 1, 2015. Consulted February 17, 2016. McKeon, Alan, Stephen Collins, & Nathan Flint. (2014). Alexander Babbage Experience Measurement, “Fine Arts Museums of San Francisco: Positioning Focus Group Key Findings,” September 30, 2014. Copyright 2014, Alexander Babbage. Paddon, Mark. (2015). Phase II Proposal of Guidekick for the Fine Arts Museums of San Francisco. May 15, 2015.
. "The de Young Museum App by Guidekick as a model for collaborative development, technological innovation, and visitor behavior insight." MW2016: Museums and the Web 2016. Published January 28, 2016. Consulted . This is great for. the handicapped who could not venture out to the museum.